Change is never cheap or easy, says Ronald Binkofski, General Manager, CEE Multicountry CIS. Service providers, such as Microsoft and Goyello, must help their partners go through this process, even if this means you have to convince them it is really worth doing. 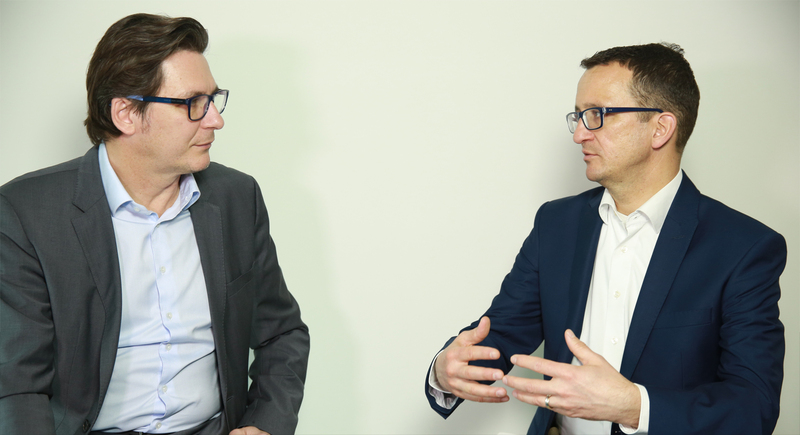 Peter Horsten, Managing Director at Goyello, talked with Ronald Binkofski about Microsoft’s cloud transition. PETER HORSTEN: Around 2010, former Microsoft CEO Ballmer claimed that Microsoft was going all in to the cloud. There was some criticism, even among partners, who felt that this would be the end of Microsoft. Now fast forward to 2017, Microsoft has shown significant revenue growth and seems to be in a better shape than ever before. The transition to a cloud-based service offering seems successful. Existing businesses are hesitating about changing their business model from a license-based model to a subscription-based one. From your experience, what lessons learned could you share with them? RONALD BINKOFSKI: Changing business models is what businesses have always struggled with. It’s a process that causes a lot of uncertainty and uncertainty makes people criticize when they lose what they had. That’s a natural thing. They have to understand that complaining and resisting the changing world is something which doesn’t take them further. Microsoft understood this changing environment quickly, mainly thanks to our history and experience. Besides, Microsoft deals with nearly every aspect of the IT industry – from consumer applications and gaming, to top enterprise solutions. This gives us a strong position on the market, but this also means we compete with nearly everyone. As a result, we have a deep insight into the industry and, therefore, it’s easier to recognize trends earlier than others. Microsoft understood the cloud trend very well and understood how to leverage it, but it took quite a battle to do it. We went through it all with passion and with a very focused execution. Today, after more or less seven, eight years, you see a different Microsoft. PH: What’s your main tip for existing business users? RB: There are periods of stability and of challenge, and therefore you should never take things for granted: people will keep on trying to get a piece of the cake. Your competitors, who are playing in the same league and using similar business model are probably not going to be your biggest challengers. You will be challenged by players you would not expect, so, my advice is not to take your great position for granted, always try to improve and always look at the small changes in your industry, rather than the big ones. Everyone understands the big things, but disruption comes from below. PH: For many companies, the transition from yearly subscriptions and licenses, towards a real subscription-based SaaS model, is a challenge. They are afraid their revenue will drop. How to allay any such doubts? RB: First of all, no transition is cheap. Besides, even if your partners are close to you and committed, they still think of their own lives first, not yours. They will always look at the situation from their own perspective. You, as their provider, can take this into account to a certain extent, but you also have to be the one to actually help them with this transition. Not everyone will follow you from day one, but once they notice the advantages, sooner or later they will. You cannot stop going ahead because someone doesn’t like what you are doing. When you are convinced you are heading in the right direction and you stick to your values, you are in the right position. PH: I’m curious, what kind of companies or solutions have surprised you over the past two or three years? RB: Nearly four years ago Azure technology, which is Microsoft’s cloud platform, was mature enough to be positioned in the market, but we struggled with how to sell it. We were used to selling products that added value from day one, however, Azure is a platform where, in most cases, the added value has to be created. The team here in Poland understood that Azure’s added value has to be created by the market, by companies which create new solutions. I have been in this business for twenty years and this software development part was always close to my heart, but even I was surprised that we found beautiful applications which generated business in places we would never have considered before. So, the biggest surprise is that the traditional business and the traditional customer base actually extended significantly. PH: One of the powers of the current cloud offering is that all kind of technologies, which before were only available to a few, are now accessible to the masses. Think about BI, machine learning, artificial intelligence, cognitive intelligence, the Internet of Things, and Blockchain. Which innovation do you believe will really be the next thing for the cloud? RB: The general statement is that innovation comes when we least expect it, so I expect a lot of surprises in the future. All these very advanced services that provide easy access to very deep analytics around big data are some of the trends which will continue. Easing the usage of this to people who don’t deal with IT is key, so whatever intelligence users need from big data systems, they need a simple tool that can do the job. Secondly, there will be enormous innovation regarding the way we interact with technology. Satya Nadella’s vision of a mixed reality world is one in which the reality that you see will be combined with virtual objects and holograms. I think we can expect enormous innovation in this direction. PH: The ongoing trends in data mining, storing data in the cloud, etc, make people wonder how secure their data is. Whether it wouldn’t be more secure on their own server. Please share your point of view. RB: When you hold something in your hand you think it’s secure, but we are already living in a virtual world. Whatever I’m holding in my hand is connected to the whole world; the physical location plays no role. I don’t think we even know how many security breaches we have in all those private data centers, because you do not even notice most of them. You might live in a beautiful world of ‘My data is secure’ and never realize someone has been watching your data day and night for several years. PH: There are many advantages of the cloud, the scalability, availability, flexibility and security, but there is also the feeling of dependency, which is a more negative feeling in this case. If the cloud goes down, which happens from time to time, then all of the sudden you cannot do anything anymore. RB: If you enter a plane, you put your life in hands of people you don’t know. You rely on the machinery, the pilot, the plane management systems, etc. Every time you fly, you do that. And sometimes the plane crashes. So, what’s the difference? When we really go into the details, you see that it’s mainly about perception. I think if you forget all the natural fears, step by step the world will understand that this cloud service based business model, the optimized utilization of big data centers and the need-based consumption of services is the way to go, rather than buying machinery yourself. PH: Despite all positive feelings and thoughts about the cloud, there are still companies that haven’t made the switch. How long can they wait? Can they just avoid going to the cloud completely? RB: Every industry has its rhythm and in every industry those who run ahead gain competitive advantage. So, it’s a question everyone must ask themselves, “Can I live without? And if I do, will I survive?” But if the competition starts eating your part of the cake, it might be too late. I think there’s a principle applicable to every business – stagnation means death. If you don’t advance, if you don’t look for new trends, if you don’t follow the trends, you might face the moment when it’s really too late, and you will have to give up. This is, I think, the nightmare of every business. Some companies that were world leaders don’t exist anymore today, but there also are companies that never gave up innovating. You might be already too late, but maybe it’s not definitely too late. Better profit from the advantage and ensure that you stay in business. PH: Final question. If you had a million, or maybe we should say a billion euros to invest, in what new technological development would you invest your money? RB: I strongly believe that the Internet of Things is going to be the big thing of the future. It is maybe going to be much more than we expect it to be and the ways we will make use of it are going to advance very strongly. All the algorithms, artificial intelligence, and big data, which is actually the backbone of the Internet of Things, is the big thing of the future. Besides, I would invest in all the things related to the mixed reality world. I would focus on making the technology light, very user-friendly. Ronald Binkofski – General Manager, CEE Multicountry CIS – Joined Microsoft Poland in 2006 and successfully built best-in-class D&PE and M&O teams in the Polish subsidiary. Prior to that, Ronald spent nearly 10 years at Software AG Germany, where he started as software engineer working in R&D, and then moved to various leadership roles within the Central and Eastern European region, culminating in his last position as Area Manager for CEE with full responsibility for the region’s operations. Peter Horsten – Co-founder & Managing Director of Goyello. Sociologist and electrotechnical engineer, a great combination that stimulates him to look for working solutions. Passionate about converting great ideas into new solutions. The interview has been published in the second issue of the moveIT magazine. Read more.